At 888’s New Jersey market facing online casino, players can access tables from Evolution Gaming’s recently launched Atlantic City dealer studio. In-casino tables from the likes of Resorts Casino Hotel, and Ocean Resort Casino are on their way also. Unibet entered the New Jersey regulated casino market when they added live tables from Evolution Gaming’s Atlantic City dealer studio in December 2018. Betfair, in partnership with Atlantic City’s Golden Nugget Casino, and live games provider Ezugi began offering live dealers to New Jersey residents in 2017. 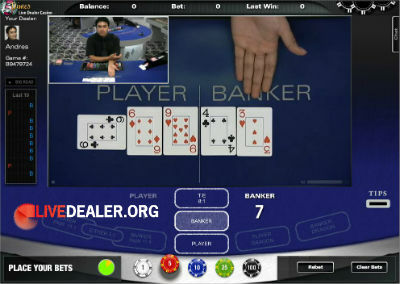 These guys have been a US facing online sportsbook for some time, and also offer live dealers. Their live games used to be provided by Global Gaming Labs, but this changed in 2017 and Visionary iGaming are their current providers. They (ViG) are a pretty solid platform, with a decent game range and a pretty lively bunch of dealers working out of their Costa Rica studio. We have found their support to be very responsive. Just at tip, the house edge on a single zero table is around 2.7%, compared to around 5.3% for American roulette (0 & 00), so best leave the American table alone! This is a ViG proprietary blackjack variation with an early payout option. It is a ‘one to many’ deal, meaning an unlimited number of players can participate in the deal. You can read more about ViG Blackjack Early Payout here. Standard Baccarat or Super 6 Baccarat. Player (1:1), Banker win with value 6 (0.5:1), all other Banker wins (1:1), Tie (8:1). They offer traditional 7 seat blackjack rather than a ‘one to many’ deal. They offer 2 live roulette options: single zero roulette and Enhanced Payout American Roulette (2.42% house edge versus 2.70% for standard single zero roulette). Their support is very responsive. They presently offer live games powered by Visionary iGaming (ViG) in their Vegas Live Dealer casino. On the downside, while there are number of funding options available to US players (eg Bitcoin, money order, cashier check, bank wire) the only fee-free withdrawal option is Bitcoin (dropped NeTeller and Skrill in 2016). The latter has a double zero table & wheel but payouts are enhanced (versus standard roulette bet payouts) to compensate for the extra zero. This game actually has a lower house edge (2.42%) than standard single zero roulette games (2.70%). You can read more about Enhanced Payout American Roulette here. Blackjack variation with an early payout option. This is a ‘one to many’ deal. Much more bang for your buck here…but it’s still a house game. Classic 7 seat blackjack, dealt live from an 8 deck shoe. Baccarat or ‘Punto Banco’ tables. Player (1:1), Banker win with 6 (0.5:1), all other Banker wins (1:1), Tie (8:1). This is a player versus the house game. An Ante bet gets you two hole cards and a look at the Flop. A Call bet sees the Turn, River and whether you have beaten the dealer. Sportsbetting.ag are owned and operated by the same company at the helm of BetOnline. Like their sister casino they recently switched live platforms; now offering games from Visionary iGaming. Note, single zero table house edge is 2.7%, compared to around 5.3% for American roulette (0 & 00). Super6 Baccarat… Player (1:1), Banker win with value 6 (0.5:1), all other Banker wins (1:1), Tie (8:1). Side bets (Pairs, Banker/Player Dragon) also offered for both versions. Since the passing of UIGEA, US players have had their work cut out for them finding online gambling sites accepting their custom. Many of the larger online gambling operators, those with a significant terrestrial presence or stock exchange listing and/or EU region license pulled out of the of the US market until such time as the legal position is clearer, or a licensing regime is introduced. The list of casinos offering live dealer games is dominated by these larger operators – probably due to the large investment and higher marginal cost of offering this service to customers. 888, bet365, Unibet, William Hill, Bwin, Betfair, Genting, Betsson etc are all heavyweights in the gambling/online gambling world but all currently adopt a no-US-wide player policy. As a consequence, finding a good live dealer casino accepting US customers is not easy, simply because there are not many of them. Although this is starting to change. In the wake of the DOJ’s softened online gambling stance, and subsequent moves by certain states (lead by New Jersey), the big operators and live game providers are now slowly moving back into the US market. 2018 has been somewhat of a landmark year in this regard with Authentic Gaming and Foxwoods Casino teaming up to offer the first US based live dealer product to players outside the US (and within New Jersey). Also in 2018 Evolution Gaming opened their first US based dealer studio, located in Atlantic City. Tables from this studio can now be played online by New Jersey residents at the likes of Unibet and 888 online casinos, with other big brands sure to follow. In time, as regulations permit, these tables may be made available to players across more US states. That is certainly the intent of some lawmakers in New Jersey looking to expand the reach of their online casinos.